SHENYANG, Aug. 29 – China on Wednesday unveiled its latest ranking for 500 largest private enterprises,with Sanhua Holding Group on the list amid sound development of the country's private business. The list by the All-China Federation of Industry and Commerce (ACFIC) came at the 2018 Summit of China Top 500 Private Enterprises held in Shenyang, the capital of northeast China's Liaoning Province. Sanhua Holding Group was listed as 2018 China's Top 500 private enterprises (NO.338), China's top 500 private manufacturing enterprises (NO.196) XI’AN, Sept. 1 -- The 2018 China Top 500 Enterprises Summit was held in Xi'an, the capital of northwest China's Shaanxi Province. 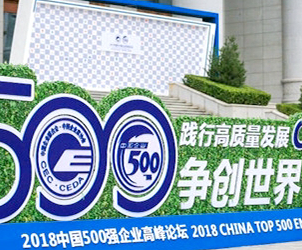 Hosted by the China Enterprise Confederation and China Enterprise Directors Association, the summit looks to publish several top 500 lists, Sanhua Holding is on the list, ranking 309th of China's Top 500 manufacturing enterprises. On 6 June 2018, SANHUA AWECO in Poland has taken part in tree planting activity which has been initiated by Grzegorz GONET (GM Poland) and Tychy plant team. Grateful for another sunny day ahead of us, our employees grabbed the spades, seedlings and started digging holes for them. As a result, after a couple hours of work, 12 trees were planted in front of the company building. We are absolutely aware that our small project will not change harmful changes in the environment. It is known that everyday approximately 41 million trees are cut down. It is far more faster than people around the world are able to replant them. As a SANHUA company we would like to demonstrate our environmental responsibility which is in line with our Policy and Corporate Social Responsibility. We remember that one of the symbols of our company is SANHUA Tree. Through our small initiative we would like to show we are committed to being green and giving back. Carbon reduction, combating climate change or producing oxygen thanks to trees are significant values for our community. The planted trees not only can maximize our positive impact on the environment but also provide nicer and greener setting. 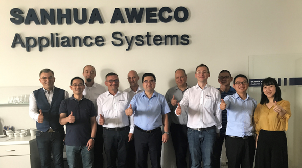 Between 21-22 June 2018, Andrew WENG accompanied by Ally LU and Xueyuan SHI has visited SANHUA AWECO plant in Tychy, Poland. The main reason for the visit were: the mid year HR review, LEAN review and discussion concerning next investments of SANHUA in Europe and particular in Tychy region. During the visit, Andrew WENG has underlined the significant improvements, noticed in the plant. Through effective delegation of authority and solid laysers of lean activities, the team has achieved close to 1M€ savings in the 1st half of the year. The positive involvement of team leaders and professional approach have been appreciated. Talent identification through professional approach and talent development through actual lean practices have been perceived as key and will lay good foundation for future business development and success. In particular, we are proud to get the IATF certifiaction, which proofs our innovative ability, premium quality and the highest standards in our automotive sector. Thanks to high involvement of all SANHUA AWECO group companies and dedication of Tychy plant team - we finished the certification process on time, without non-compliance. This challenging process showed that as ONE TEAM, we are capable to pass even the hardest exams. 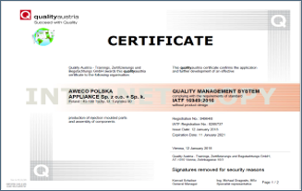 We are proud to provide to our customers our new certificates and quality of processes and products. We have ambition to grow in the automotive industry and we just completed the first, most important milestone.